BEIJING, May 16 (Xinhua) -- President Xi Jinping said Tuesday that China is willing to continue to provide Myanmar with assistance in its internal peace progress. Xi made the remarks when meeting with Myanmar State Counselor Aung San Suu Kyi, who attended the Belt and Road Forum for International Cooperation held in Beijing on May 14-15. He called on the two sides to jointly maintain peace and stability on the border. Xi noted that the two countries have a deeply rooted friendship and extensive common interests, and the two sides reached important consensus on all-round strategic cooperation in the new era during Myanmar President U Htin Kyaw's visit to China last month. He said China and Myanmar should boost their ties and advance the construction of key projects, economic corridors, economic zones and infrastructure. Aung San Suu Kyi commended the Belt and Road Initiative as one that will bring peace, reconciliation and prosperity to the region and the world at large. 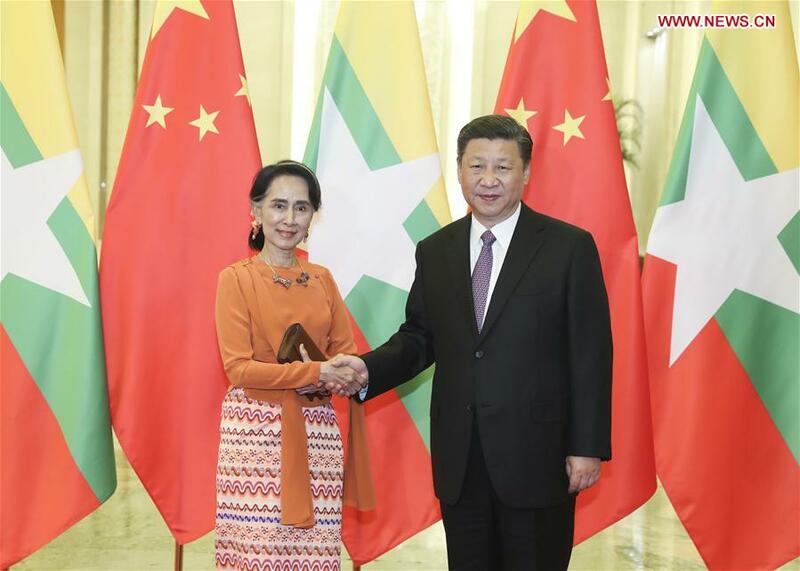 She said Myanmar is grateful to China for its efforts in advancing her country's internal peace progress. Myanmar stands ready to work with China on peace and stability on the border. In a separate meeting with Aung San Suu Kyi on Tuesday, Chinese PremierLi Keqiangurged an early cease-fire in northern Myanmar to ensure peace on the border. Li said China supports the second meeting of the 21st Century Panglong Peace Conference to be hosted by Myanmar. The meeting is an inclusive dialogue designed to open to all armed groups. On joint projects, Li called for steady progress of oil pipelines, ports, and economic zones. He also demanded proper handling of the Myitsone hydro-power station to "guide cooperation expectation and boost confidence." The project on the Ayeyawaddy River started in December 2009 but was suspended by the previous government in 2011. With an installed capacity of 6,000 megawatts, the project was designed to yield 29,400 million kilowatt hours a year on completion by 2019.